You like cassava for dessert? Then this easy to follow simple recipe is a must try. Less sweeter and no oven needed. You do have the option to add custard like topping or just keep it plain. I would say give this recipe a try. You might like it, I know I did. Clean banana leaves well and microwave for a minute, set aside. Place enough water in the steamer and bring to a boil. Using a deep bowl beat eggs then add the butter, condensed milk, coconut milk and vanilla. Mix well. Cover baking pan with wilted banana leaves. Pour cassava mixture and tightly cover the pan with aluminum foil. Steam for 45 minutes or till fully cooked. 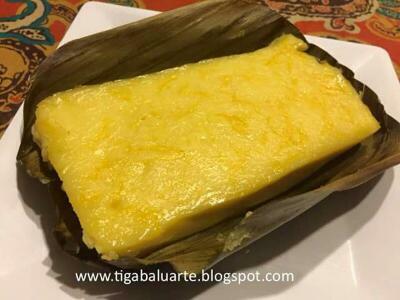 Once cassava cake is fully cooked remove pan from the steamer and allow it to cool for at least 5 minutes before removing the aluminum foil to avoid the steam from burning your skin. Save the aluminum foil for later. While waiting for the cassava cake to cool off mix the topping ingredients (egg yolks, condensed milk, coconut milk and vanilla extract) in a bowl. 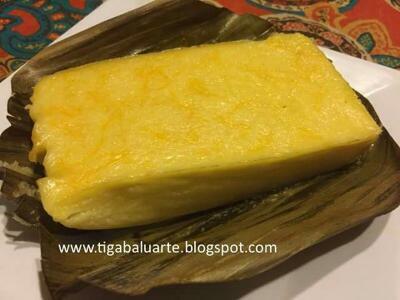 Pour mixture slowly on top of the cooked cassava cake and top with grated cheese. Cover again with aluminum foil and return to the steamer. Steam for 20 minutes or till topping is fully cooked. Remove pan from the steamer, allow to cool and serve. I do like to eat it fresh of the steamer but others like to wait. Sometimes depends on how long I can wait. Serve with your favorite beverage. I prefer hot tea with my freshly steamed cassava cake during rainy days.